What experts and the public have already long suspected is now supported by representative data collected by researchers at Ruhr-Universität Bochum (RUB) and University of Basel: ADHD, attention deficit hyperactivity disorder, is over-diagnosed. The study showed that child and adolescent psychotherapists and psychiatrists tend to give a diagnosis based on heuristics, unclear rules of thumb, rather than adhering to recognized diagnostic criteria. Boys in particular are substantially more often misdiagnosed compared to girls. These are the most important results of a study conducted by Prof. Dr. Silvia Schneider and Prof. Dr. Jürgen Margraf (both from RUB) and Dr. Katrin Bruchmüller (University of Basel) as reported in the periodical Journal of Consulting and Clinical Psychology. The researchers surveyed altogether 1,000 child and adolescent psychotherapists and psychiatrists across Germany. 473 participated in the study. They received one of four available case vignettes, and were asked to give a diagnoses and a recommendation for therapy. In three out of the four case vignettes, the described symptoms and circumstances did not fulfil ADHD criteria. Only one of the cases fulfilled ADHD criteria based strictly on the valid diagnostic criteria. In addition, the gender of the child was included as a variable resulting in eight different case vignettes. As the result, when comparing two identical cases with a different gender, the difference was clear: Leon has ADHD, Lea doesn’t. Many child and adolescent psychotherapists and psychiatrists seem to proceed heuristically and base their decisions on prototypical symptoms. The prototype is male and shows symptoms such as motoric restlessness, lack of concentration and impulsiveness. In connection with the gender of the patient, these symptoms lead to different diagnoses. A boy with such symptoms, even he does not fulfil the complete set of diagnostic criteria, will receive a diagnosis for ADHD, whereas a girl will not. Also the therapist’s gender plays a role in the diagnostic: male therapists give substantially more frequently a diagnosis for ADHD than their female counterparts. In the past decades the diagnoses ADHD have become almost inflationary. Between 1989 and 2001, the number of diagnoses in German clinical practise increased by 381 percent. The costs for ADHD medication, such as for the performance-enhancer methylphenidate (Ritalin), have grown 9 times between 1993 and 2003. The German health insurance company, Techniker, reports an increase of 30 percent in methylphenidate prescriptions for its clients between the ages of 6 and 18. Similarly, the daily dosage has increased by 10 percent on average. Considering these statistics, there is a remarkable lack of research in the diagnostic of ADHD. “In spite of the strong public interest, only very few empirical studies have addressed this issue,” Prof. Schneider and Dr. Bruchmüller point out. While in the 70s and 80s a “certain upswing” of studies on the frequency and reasons for misdiagnoses could be observed, current research hardly examines the phenomena. The current study shows that in order to avoid a misdiagnosis of ADHD and premature treatment, it is crucial for therapists not to rely on their intuition, instead to strictly adhere to defined, established diagnostic criteria. This is best possible with the help of standardized diagnostic instruments, such as diagnostic interviews. Research: possible link between convergence insufficiency and attention deficit disorder (ADHD), the answer to everything? Convergence is the inward movement that both eyes make when, for example, we are approaching an object close to the eyes. Both eyes should be looking at the same location in space. Convergence insufficiency is a difficulty for the eyes to move more and more near the nose. When convergence is insufficient, the child may suffer from eyestrain or even double vision, depending on the extent of the problem. In fact, the convergence test is rather simple to administer. Ask the child to look at a target (small penlight or a pencil, for example) which is located at eye level. 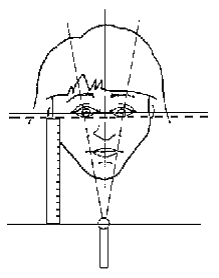 Approach the target to the eyes, which will be converging until either 1) the child reports double vision or 2) you can observe that one eye loses fixation and moves outwards. Note the distance at which this occurs. 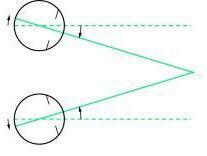 This portion of the test is called the “break point of convergence.” The normal distance is about 5 cm (2 inches). Closer still, the eyes can not converge anymore. The second part of the test is to measure the “recovery point” of convergence. Once the break point is reached, you simply move the target slowly away from the eyes until you see that both eyes are now fixating the target. The normal distance from the point of recovery is about 10 cm (4 inches) (see figure below). Of course, doing the test requires some practice. An article published in the scientific literature in 2005 has created a stir that still persists. We know that the diagnosis of ADD or ADHD is mainly done by questionnaire and that there are no objective tests to make this diagnosis. But in 2005, a research has shown a possible link between convergence insufficiency and attention deficit hyperactivity disorder (ADHD). The beginning of a new era? A potential relationship between convergence insufficiency and attention deficit hyperactivity disorder (ADHD) has been uncovered by researchers at the University of California, San Diego. “This is the first report on the potential connection of these two disorders,” Dr. David B. Granet, ophthalmologist [UCSD Shiley Eye Center]. Now back to the study by Dr. Granet and his team. This study argues that children being evaluated for attention deficit hyperactivity disorder (ADHD) often have an eye exam as part of their evaluation. The symptoms of convergence insufficiency (CI) can make it difficult for a student to concentrate on extended reading and overlap with those of ADHD. Surprising statement from an ophthalmologist when we know that these doctors are rarely concerned with such problems. A retrospective review of 266 patients with CI presenting to an academic pediatric ophthalmology practice was performed. All patients included were diagnosed with CI by one author and then evaluated for ADHD diagnosis. A computerized review was also performed looking at the converse incidence of CI in patients carrying the diagnosis of ADHD. Twenty-six patients (9.8%) were diagnosed with ADHD at some time in their clinical course. Of the patients with ADHD and convergence insufficiency, the review of computer records showed a 15.9% incidence of CI in the ADHD population. It would therefore seem to be a three-fold greater incidence of ADHD in patients with convergence insufficiency when compared with the incidence of ADHD in the general US population (1.8-3.3%). The authors also noted a three-fold greater incidence for this convergence problem in the population with ADHD. This may simply represent an association and not be a causal link. But just before Dr. Granet’s article, a team of optometrists (Borsting et coll., 2005) publihed a research on the same subject a a few months before. Borsting et al. identified accommodative (focusing) and convergence insufficiency problems in relation to other learning difficulties such as attention deficit hyperactivity disorder (ADHD). The purpose of this study was to evaluate the frequency of ADHD behaviors in school-aged children with symptomatic accommodative dysfunction or convergence insufficiency. 24 children from 8 to 15 years of age with symptomatic accommodative dysfunction or convergence insufficiency were included in this study. One parent of each child completed the Conners Parent Rating Scale-Revised Short Form (CPRS-R:S). The children’s scores on the CPRS-R:S were compared with the normative sample. Regarding the Conners questionnaire, and more specifically the S, cognitive problem/inattention, hyperactivity, and ADHD indexes were significantly different from normative values (p < or = .001 for all tests). The results from this preliminary study suggest that school-aged children with symptomatic accommodative dysfunction or convergence insufficiency have a higher frequency of behaviors related to school performance and attention as measured by the Conners questionnaire. Gronlund et al. in 2007 studied various aspects of visual function in children with attention deficit hyperactivity disorder (ADD / ADHD) and establish whether treatment with stimulants is reflected in functioning of the visual system. In all, 83% of children had normal visual acuity without treatment, and 90% with the use of stimulants. A problem with eye alignment (phoria) was found in 29% without treatment, and 27% with stimulants. A stereoscopic vision problem (three-dimensional vision) was found in 26% without stimulants, and 27% with stimulants. Abnormal convergence (> 6 cm or no convergence) was noted in 24% without treatment and 17% with treatment. Signs of visual-perceptual problems were found in 21% of all children. Children with AD/HD had a high frequency of visual findings, which were not significantly improved with stimulants. For children with «dyslexia», the trouble begins even before they start reading and for reasons that don’t necessarily reflect other language skills. That’s according to a report published online in Current Biology, a Cell Press publication, that for the first time reveals a causal connection between early problems with visual attention and a later diagnosis of dyslexia. “Visual attention deficits are surprisingly way more predictive of future reading disorders than are language abilities at the prereading stage,” said Andrea Facoetti of the University of Padua in Italy. The researchers studied Italian-speaking children for a period of three years, from the time they were prereading kindergarteners until they entered second grade. Facoetti’s team, including Sandro Franceschini, Simone Gori, Milena Ruffino, and Katia Pedrolli, assessed prereaders for visual spatial attention — the ability to filter relevant versus irrelevant information — through tests that asked them to pick out specific symbols amid distractions. 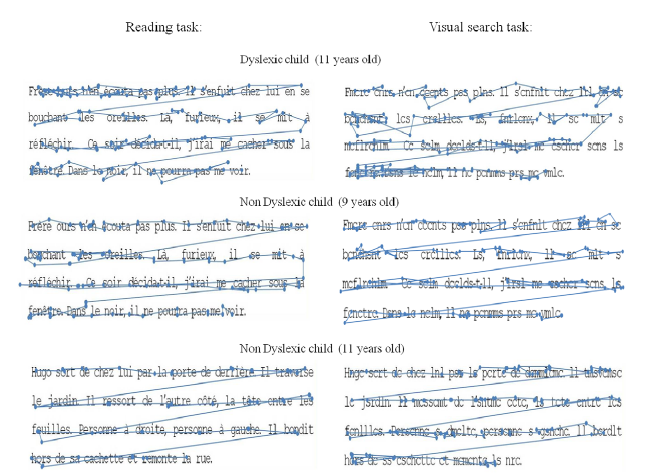 The children also took tests on syllable identification, verbal short-term memory, and rapid color naming, followed over the next two years by measures of reading. Visual Spatial Memory: the ability to recall the spatial location of an object or stimuli. The ability to be able to recall, identify, or reproduce a design or dominant feature of an object. Visual memory is important throughout school. Example: Being able to picture a lost object; seeing a printed word and developing a mental picture to the corresponding object. Visual Sequential Memory: Ability to view and then recall a sequence of numbers, letters or objects in the order they were originally presented. Visualization is the ability to remember (mentally) a picture or object seen and mentally manipulate the image in different ways. We can then form a mental image that is used in the present or in the future. This ability is essential in spelling, oral math and to be able to recall scenes, events, instructions. The child must first consider the first form. Then he must find which of the four forms which, once assembled with the first, will be a perfect square. Visual Speed & Span of Perception: The rate and amount at which information is being handled in visual processing. For example, the ability to rapidly compare visual configurations and identify two figures that have similar or identical or to identify some particular detail that is buried in distracting material. It is also the process of selectively concentrating on one aspect of the environment while ignoring other things. Example: quickly and efficiently copying an assignment off the chalkboard with only a few glances vs. needing to glance at the chalkboard after every one to two words or bits of information is copied. Once all of these skills are developed, it is important for them to become automatic so they take up less brain power to use. In order to have efficient visual information processing skills, you have to learn the skills well to the point where they become easy. Automaticity is the key in efficient learning. Learning to read and write is a human’s most difficult task in his whole life. Reading and writing are very complex tasks that require many visual perceptual, auditive and tactile abilities. The optometrist specialized in vision training must assess all visual and perceptual abilities. This is why assessment of these skills takes more time. Vision therapy is a series of motor, visual and perceptual activities designed to enhance those skills. Because these skills are learned between 0 and 6 years old, they can be learned again or trained to obtain a maximum of efficacy. In 2010, Dhingra and coworkers have analyzed the relationship between different perceptions (visual, auditory, kinesthetic and tactile) and academic performance of a number of children. They used parts of standardized tests that specifically measured the adequacy of these perceptions (including McCarthy Scales of Children’s Abilities and WISC III-R). Taken together, the children’s academic achievement (which the authors defined as all three academic areas, including reading, spelling and mathematics) was significantly correlated with mainly three perceptual channels, namely, visual perception (r = 0.521, p <0.001), auditory perception (r = 0.544, p <0.001) and kinesthetic perception (r = 0.186, p <0.05). First, performance in reading and spelling were significantly associated (students who are good readers are also good in spelling), and these two academic areas were closely linked to the three perceptual aspects mentioned above. On the other hand, mathematics achievement was linked only to the auditory and visual perception. Thus, the results indicate, among other things, that visual and auditory perceptions play a crucial role in learning. Another study, by Goldstand in 2005, was designed to compare visual and perceptual skills between children with or without moderate school problems in reading and examine the impact of visual deficits among them. The authors compared the results of seventy-one seventh-grade students, where 46 had no problems reading and 25 had moderate problems in reading. They used scores from visual screening tests of visual perception, tested visual-motor integration, and school performance. In addition, they have subsequently compared academic performance and processing of visual information between children who were successful or not in the visual tests. Visual deficits were found in 68% of participants, and in more boys than girls. Readers with reading problems had significantly poor overall school performance and lower scores in the vision screening tests than the good readers. Participants who successfully completed the vision screening had significantly better results in visual perception than those who failed. Visual and perceptual functions distinguish well between children with and without mild learning difficulties. The high incidence of visual problems in children who do not always succeed in school tells us that it is important to assess the visual and perceptual deficits in schoolchildren with difficulties in academic performance. Goldstand S, Koslowe KC, Parush S.Vision, visual-information processing, and academic performance among seventh-grade schoolchildren: a more significant relationship than we thought? Am J Occup Ther. 2005 Jul-Aug;59(4):377-89. We discussed the principal perceptual skills a child must master in order to better process visual information both at school and elsewhere. Vision and perception affect all aspects of children’s lives. In a sense, the visual perception is the process of visual thinking more than the eye itself. Directionality incorporates up, down, ahead, behind, and any combination thereof into the equation. It also means projecting these directions including left and right out into space. Again, a person must understand these concepts as they relate to themselves before they can apply them to other things. Directionality is very important in decoding letters. If a child does not have this concept properly integrated, earning to read can be very confusing. For example, the letters “b,” “d,” “p,” and “q,” all look like the same symbol if he or she does not have any concept of orientation. FACT: Research has shown that children who still have reversal problems after age 8 will likely have problems developing good reading skills. These skills, however, can be trained or learnt by vision training. An important function that bridges laterality and directionality is our eyes. Efficient eye movement skills are essential in developing good directionality skills. If your eyes cannot move across a page smoothly and accurately, this could mean that you are at risk for reversals and coding problems, because how we scan a letter is important when coding it to the brain. – Graphical directionality: depending on whether the child is right or left handed, letters or shapes are not intrinsically formed in the same direction (from right to left or left to right). But, writing in English requires a graphical movement from left to right (even for left-handed children). Relationship with reversals of letters and/or numbers. – Spatial directionality: the projection outside the organism in space and/or on paper. The child must match his outside relations of space with the inside relations of his body. The observation of relationships between objects in space. Bilateral integration is another visual-spatial skill that is important. This is the ability to effectively use both sides of the body separately (like typing) and/or simultaneously (like riding a bicycle). Bilateral integration is another visual spatial skill that is important. This is the ability to effectively use both sides of the body separately (like typing) and/or simultaneously (like riding a bicycle). This skill cannot be developed fully unless laterality is learned well, too. If you do not have the concept of the difference between both sides of your body, it is very difficult to learn how to coordinate them. Body schema or body awareness concerns the integrated knowledge of all parts of the body as reference points in space (relationship with gross motor, general coordination, sports, etc. ), since the body acts as a point of reference in space when we move. This is the set of process which detects the position of body parts in space. Visual analysis, or visual discrimination, is used to identify, sort, organize, store and recall visually presented information. It is the ability to take in visual information, remember it and apply it later. Children with poor visual analysis skills often have trouble learning the A, B, C’s and recognizing words or simple forms even when presented repeatedly; for example, they may correctly read the word “house” in one sentence and incorrectly read “horse” two lines later. These kids tend to mistake words with similar endings or beginnings, generalize when grouping objects. They also have a hard time understanding size and magnitude, (a cup of water in a tall glass and a cup of water in a shallow bowl are not seen as equal amounts). Figure Ground: An ability to attend to or search for a specific form or feature while simultaneously ignoring irrelevant information. Example: looking for a specific piece of information when reading or searching for a specific tool in a toolbox full of tools. The ability to discriminate differences in forms or shapes. This includes differences of size, shape, color and orientation. Form constancy is the recognition that visual information in a form is consistent in spite of the object, size in the back of the eye, or location. Visual discrimination is thus the ability to observe subtle similarities or differences among shapes or symbols. It is related to visual attention. 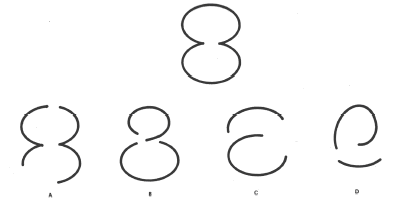 Form perception is the ability to recognize basic shapes that will constitute letters and/or numbers. Many children have difficulties to see and copy shapes on paper. Visual Closure: The ability to recognize clues presented visually that allow him or her to determine the appearance of the final product without all the details being present. Example: Being able to complete a word when only part of the word is seen; recognizing what will appear in a picture before it is completed. In this activity, the child must recognize which of the examples in the bottom represents the figure on top.